For the history buff, spending a day or week among the dusty annals of a library’s special collection sounds like a vacation made in heaven, whereas, for most of us, such an endeavor is a lot less fun. Regardless of its importance in the overall scheme of things, for the majority of people, any engagement with “history” needs to involve some pretty hefty razzle dazzle to attract and hold our attention, which is why history buffs invented historical reenactments, which are a fantastic way that history gets preserved and learned. Experience Niagara’s past in tandem with its stellar present by visiting Niagara Falls during one of these three reenactments during the month of July. A historical reenactment is an entertaining and educational activity that involves a group of people reenacting an event that took place some time in the past. Spectators attend and observe from the sidelines in order to get a fly-on-the-wall view of the event as it unfolds. Most reenactments are of battles, and they take place all over the world to mark significant times of war in a given location in a nation’s history, and the Niagara region is home to some excellent ones. 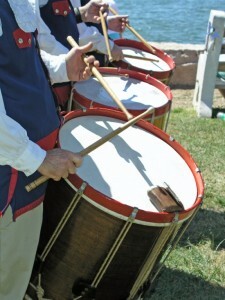 On July 11 and 12 at the Fort George Historic Site, reenactors from all over North America will join together to mark the 202nd anniversary of the Battle of Fort George. A bloody fight that took place during the War of 1812, the Battle of Fort George was a seminal engagement in the Niagara region’s history that saw the Americans defeat British troops to successfully capture the fort. In addition to battle reenactments that will take place on Saturday and Sunday, the weekend will also include musket firings, period music, artillery presentations, and more. Another engagement during the War of 1812, the Battle of Chippewa took place nearly two years after the Battle of Fort George, and while it resulted in another American victory over the British — and caused significant British losses — it nevertheless failed to allow the Americans to make much headway in the war overall. 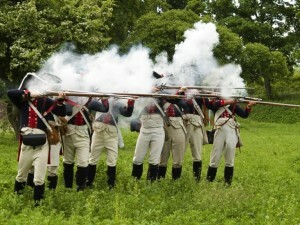 This July 5 marks the anniversary of that battle, and reenactors will take to the field to relive it at 2 p.m.
On the first weekend in July, the Siege of 1759 that took place during the French and Indian War will be reenacted at Fort Niagara. Hundreds of reenactors are slated to attend for both the battle reenactments and the living history camps. Period artisans, craftspeople, and merchants will also be on-site, and there will also be artillery firings, musket demonstrations, Native councils, military music concerts, youth recruitment demonstrations, special exhibits, and much more. No matter which end of the history-loving or hating spectrum you routinely find yourself on, the month of July boasts three spectacular events in and around the Niagara region sure to stoke your curiosity of what Niagara was like long before the 21st century.